BERNICE FRIESEN was born in Rosthern, Sask. and grew up on her grandparents’ homestead. The life of her grandmother’s family has been published in The Mulberry Tree by Victor Carl Friesen and Anna Friesen. She trained as a printmaker at the University of Saskatchewan, ending up with a B.F.A in visual art and a B.Ed. by 1990. She took creative writing courses with Elizabeth Brewster, Guy Vanderhaegue and Tim Lilburn, and attended the Banff Writing Studio. She has been an art studio lab assistant, art gallery educator, and has taught Sage Hill Writing Experience for teens, and Fiction Freefall through the Saskatoon Writers Coop. Her writing and art has been published in Canada and Europe, and has twice been short-listed for the CBC Radio Literary Awards. 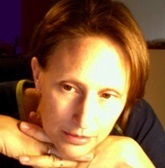 Her writing has been included in two League of Canadian Poets winners anthologies, and Best Short Stories, 2002, (Oberon). She has lived in England, New Zealand and British Columbia, has taught herself to read French and Italian, and is currently trying to understand quantum physics. Go to her website for more.